Hyuntek Yoon and Soobum You of Team Atelier Why shared with us their first prize winning proposal in the Detroit Riverfront competition. Their ‘Forest’ concept, which aims at being a fairy tale between the city and the forest by ‘filling’, is the focus of the urban development. 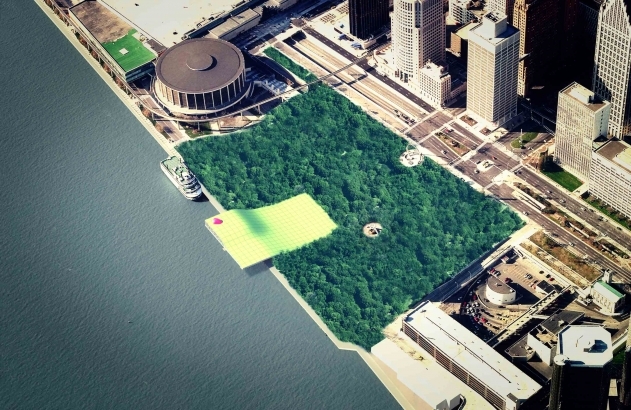 Currently, the site is filled with voids, such as trees and the knoll, but the forest creates rich stories with the city. Providing spaces that are more secure and for smaller activities, people will have the chance to experience nature. More images and architects’ description after the break. Many things fill the city and continue to do so. The act of “filling” is the virtue of urban development. For example, developers in the city of Detroit kept filling its voids. Many buildings and infrastructure have filled the city, and those became the symbol of Detroit. A rapid pace of growth is the result of such efforts to fill space. Downtown is represented by new businesses and the Renaissance of Detroit. Many skyscrapers filled the downtown Detroit area. However, the city needs space to breath. The city is far too compact to communicate with people and nature. Public spaces and nature are not enough. The site is located at the node of the radial street plan. The site needs to be filled in another way so that the city can breathe easily again. 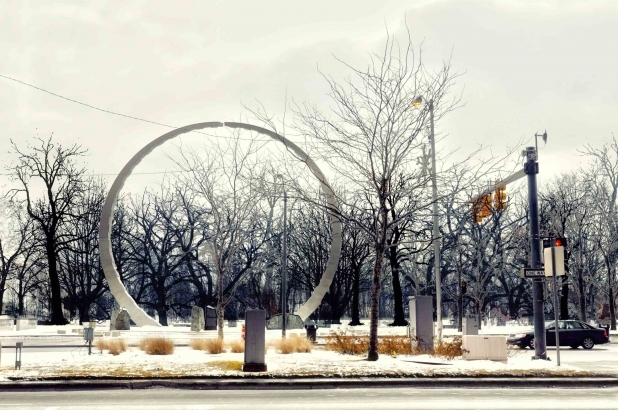 The site has natural elements and a public space that is represented by the trees and the knoll. People will have diverse experiences based on the spatial scale variation and variety of activities. The knoll is part of the forest. It have wide knoll for larger activities such as large-scale performing arts. It will also provide a large canopy front for the waterfront. The site will be a landmark of the city without a high rise or a monumental building because spatial mass will provide a big contrast. Edge-Forest Wall On the edge of the park, the area will be filled with tall trees to create a deep contrast with the urban context. People will not be able to notice what is going to be unfolded to them beyond the forest due to the density of trees. This will arouse curiosity and poetic imagination in people as if they are in Wonderland or in unknown world. Radically, it will be difficult to establish any attempts to control the movement of visitors such as signs and entrances or pedestrian roads on the street. People will meander slowly on small trails through the forest, which will be covered with soil and dirt without any determined direction. The density of the forest provides people who approach the park along the wide main streets or Jefferson Avenue with a strong reversal of perception in terms of scale.